Pauline Smith, Absolute Theatre, Australia. Jay McKee, Stage Whispers, Australia/NZ. 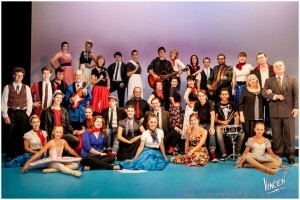 “Awesome show tonight… Well done cast and crew of Billy Buckett at Beenleigh Theatre Group. Fantastic entertainment – I thoroughly enjoyed it.” J.L. “The whole show was fantastic – the lighting, choreography, the level of performance, the sets, the singing, the acting, the band, and the music all were so well done and it was just a great production. My favourite song? Photographs and Memories – yes, I cried. And that’s not the only part I got teary in.” M.B. “We all LOVED it – our girl was whooping and cheering and then screaming by the end of it! We had sore hands from clapping, and I loved looking around seeing many of our friends giving a standing ovation at the curtain call. Congratulations on a brilliant performance, a knock-out show, a ripper of a way to spend an afternoon.” M.B. “We just saw the best Musical Theatre production evaaaaa. Billy Buckett. Amazing, stunning, funny. touching, awesome and so damm feel good.” S.M.M. “Just wanted to say: Billy Buckett was amazing – Still have the songs stuck in my head!” B.T. “Great show guys – really enjoyed tonight’s show. Will be back – it’s about 30 years since I’ve seen a Beenleigh Theatre Group show.” C.W. “It was fantastic, brilliant and wonderful; the singing, the dancing, the music, the atmosphere, both in the foyer and on stage. Like a big party.” M.B. “Wow! What an amazing show! Music was great – couldn’t sit still! Costumes – so realistic and detailed! Entertaining, energetic, funny, etc. What an incredibly talented bunch of people we have in Logan!” G.N.